In terms of consumer perception, 2018 wasn’t the best year for Tesla. After becoming the most valuable US automaker with a market capitalization of $50.9 billion in April 2017, a series of mishaps damaged how the general public views the brand, according to new data from Plan and Track. A fatal crash involving Tesla’s Model X operating on autopilot in March 2018, followed by production delays with its Model 3, coincided with a drop in Tesla’s Buzz score, which asks consumers if they’ve heard something positive or negative about the electric automaker in the past two weeks. A few months later, Tesla co-founder Elon Musk posted a controversial tweet about taking the company private and was seen smoking marijuana while speaking with comedian Joe Rogan on his live podcast. Following these events, the brand’s Buzz score dropped to a low of -5 among all US adults, falling from around +10 at the beginning of 2018. 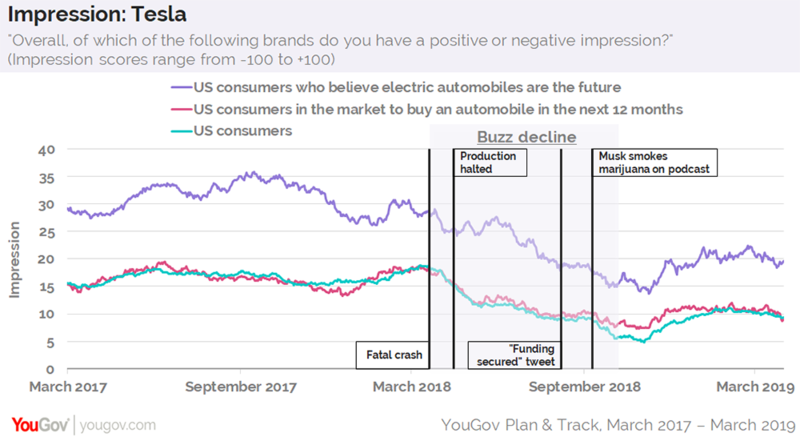 As the chart above shows, Tesla’s Buzz score also declined among US consumers planning to buy an automobile within the next 12 months, as well as those who believe electric vehicles are the future of the motor industry. 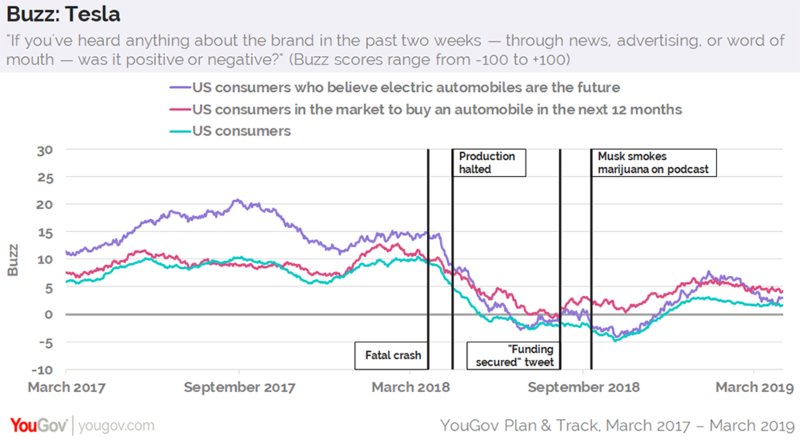 Additional data shows a similar downward trend with Tesla’s Impression score, which asks consumers if they have an overall positive or negative impression of the brand. Impression levels among all three aforementioned consumer groups began decreasing after the fatal crash in March 2018. Although Tesla has seen some positive movement in recent months, the brand’s Impression metric has yet to experience a full recovery. When it comes to Purchase Consideration, which asks consumers if they’d be open to buying a Tesla when next in the market for a car or truck, Tesla’s levels have remained fairly consistent throughout the period of poor publicity. At present, 9% of US adults who believe electric vehicles are the future of the auto industry show interest in purchasing a Tesla when next shopping for an automobile. Meanwhile, 6% of both consumers planning to buy an automobile within the next 12 months and the general public report the same. 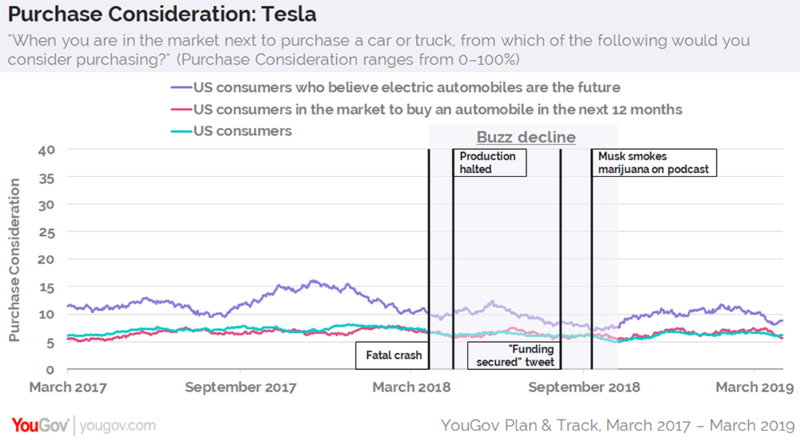 Although sales of electric vehicles in the US composed only an estimated 2% of the overall market in 2018, YouGov data shows that 55% of American adults believe electric automobiles are the future of the motor industry. In Norway, on the other hand, nearly 60% of all new cars sold last month were electric, reports Reuters — a possible glimpse of what’s to come. US consumers who believe electric automobiles are the future tend to skew younger, as 58% fall within the age range of 18-49. Furthermore, over two-thirds (68%) of these individuals consider fuel consumption the most important feature when buying a new car, compared to 58% of the general public.